US appeals court has ruled that hundreds of American navy personnel can pursue a compensation suit against the government of Japan and Tokyo Electric Power Co. for illnesses allegedly caused by exposure to radioactivity in the aftermath of the 2011 accident at the Fukushima Dai-ichi nuclear plant. Epidemiologist Rosalie Bertell (PhD, biometrics) explains the effects of the weaponized DU on the people of Iraq and the planet. In subsequent parts of this series, Dr. Bertell offers readily-accessible ways to detox some heavy metals and poisons from the body. 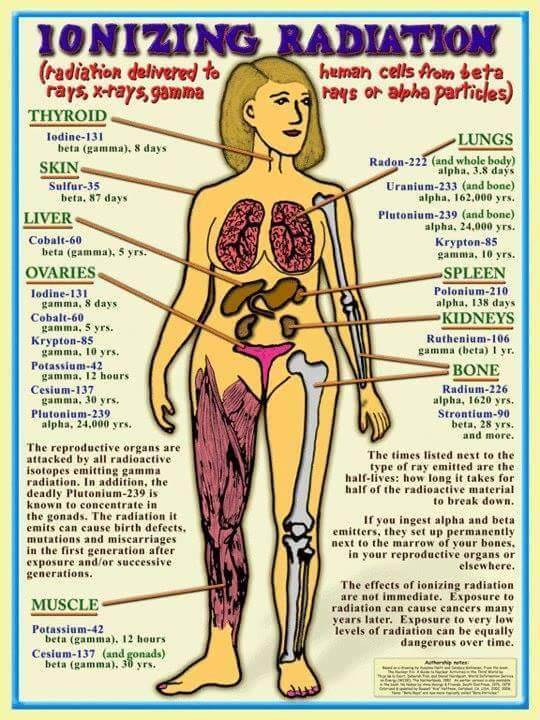 The Human body soaks up Radiation like a sponge. “Radiation has no color or smell, but after some time its devastating impact on health and the environment becomes obvious,” Eduardo Rodriguez Farre, radiobiologist of the Higher Council for Scientific Research of the country, wrote about the consequences of a nuclear explosion at the plant in Japan. Farre said that scientists have already calculated the percentage of emissions such as iodine and cesium, caused by the disaster at the Fukushima nuclear power plant. Due to an earthquake, malfunctioning of the cooling systems has occured at the plant and, consequently, the partial meltdown of the two reactors. The core of one reactor contains over 60 radioactive substances resulting from the splitting of uranium. The lifetime of these elements may vary, but almost all of them are easy to take root and accumulate in the human body due to its resemblance to human biological elements. Rodriguez Farre, one of the world’s leading experts in the field of nuclear radiation and author of works about the consequences of the Chernobyl catastrophe, claims that of these 60 elements iodine, strontium-90 and cesium (C – 137) present the greatest danger to humans. “Iodine acts instantly and provokes mutations in genes that may cause thyroid cancer,” says the toxicologist, remembering that after the explosion in Chernobyl the incidence of this disease in Central Europe has increased tenfold. As for the other elements, strontium accumulates in human bones for over 30 years, like calcium, and during all these years, it is exposing the body to fatal radiation, while cesium is deposited in the muscles. All of these substances increase the risk of cancer of any kind, especially the bones, muscles and brain, but also weaken the immune system and can cause other disorders. This is because while men’s sperms completely changes every 90 days and during this period the infected sperm dies, the female eggs are in the ovaries for the lifetime. Before a girl is born, up to 450 thousand eggs is formed in the ovaries. Their number is reduced each menstrual cycle. Accordingly, if the egg contaminated by radiation is fertilized, the effects of radiation will sooner or later affect the child. Toxicity of inhaled plutonium dioxide in beagle dogs. Muggenburg BA1, Guilmette RA, Mewhinney JA, Gillett NA, Mauderly JL, Griffith WC, Diel JH, Scott BR, Hahn FF, Boecker BB. This study was conducted to determine the biological effects of inhaled 238PuO2 over the life spans of 144 beagle dogs. The dogs inhaled one of two sizes of monodisperse aerosols of 238PuO2 to achieve graded levels of initial lung burden (ILB). The aerosols also contained 169Yb to provide a gamma-ray-emitting label for the 238Pu inhaled by each dog. Excreta were collected periodically over each dog’s life span to estimate plutonium excretion; at death, the tissues were analyzed radiochemically for plutonium activity. The tissue content and the amount of plutonium excreted were used to estimate the ILB. These data for each dog were used in a dosimetry model to estimate tissue doses. The lung, skeleton and liver received the highest alpha-particle doses, ranging from 0.16-68 Gy for the lung, 0.08-8.7 Gy for the skeleton and 0.18-19 for the liver. At death all dogs were necropsied, and all organs and lesions were sampled and examined by histopathology. Findings of non-neoplastic changes included neutropenia and lymphopenia that developed in a dose-related fashion soon after inhalation exposure. These effects persisted for up to 5 years in some animals, but no other health effects could be related to the blood changes observed. Radiation pneumonitis was observed among the dogs with the highest ILBs. Deaths from radiation pneumonitis occurred from 1.5 to 5.4 years after exposure. Tumors of the lung, skeleton and liver occurred beginning at about 3 years after exposure. Bone tumors found in 93 dogs were the most common cause of death. Lung tumors found in 46 dogs were the second most common cause of death. Liver tumors, which were found in 20 dogs but were the cause of death in only two dogs, occurred later than the tumors in bone and lung. Tumors in these three organs often occurred in the same animal and were competing causes of death. These findings in dogs suggest that similar dose-related biological effects could be expected in humans accidentally exposed to 238PuO2.